Glitter Sweet: "Rose-gold flecks suspended in inky black lacquer mean a fiercely futuristic look," says the mag. To get this look, use Lippmann Collection Nail Lacquer in Superstar. Another option is Rescue Beauty Lounge Nail Polish in Look Rich, Be Cheap. She's All Matte: For this no-shine look, try OPI Matte Nail Lacquer in Russian Navy, or Knock Out Cosmetics Flatte Nail Polish in OX. 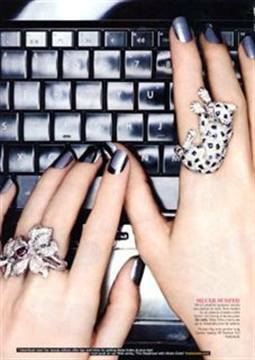 Silver Surfer: Try Minx for an "almost-indestructible finish," says Marie Claire. On these nails: Silver Minx manicure. Fade to Black: "This sleek ombré effect is fashioned from layers of Calgel's healthy-for-nails liquid overlay," according to the mag. On these nails are Calgel color gradation tips.